Melodic tunes filled the air of the small, self-made music studio in Michael Nasty’s townhouse, as he sifted through a setlist of songs on a casual Thursday night. “This one is a bit suckish,” Nasty said, a humble smirk creeping up on his face as he clicked on a song he had previously produced. A heavy beat marched from his speakers, the bright yellow rims vibrating to match the music. As the song played, Nasty sat still, focusing in on the sounds silently. His demeanor expressed that of an industry veteran, a musical analyst who had been in the game for a long time. Despite this, his casual outfit and youthful face hinted at quite the opposite – that he was an up-and-coming artist hoping to make a name for himself in the music industry. 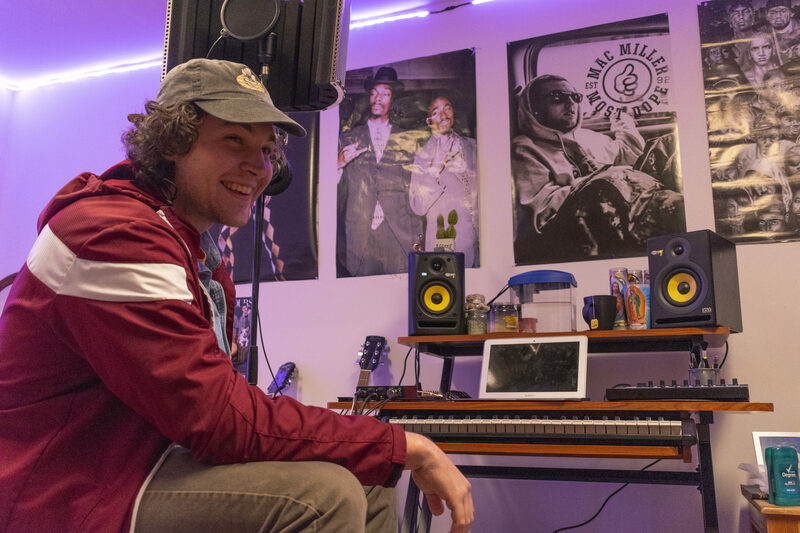 Michael Vaughn “Nasty,” a Towson sophomore from Rockville, began his musical journey at a young age, and insists it was by choice rather than by pressure. Although Nasty’s first foray into music began with learning to play the guitar as a child, he developed a passion for rap music that influenced his career goals as a musician. Once he began recording and rapping during his freshman year of high school, there was no going back. Nasty cited rappers like 50 Cent, Kendrick Lamar, J. Cole and Chance the Rapper as some of his main sources of inspiration, as well as old school rock legends like Queen and The Red Hot Chili Peppers. Above all, Miller is one of Nasty’s biggest idols. A black-and-white poster of the late rapper sits center on Nasty’s studio wall, surrounded by other industry greats. Miller’s influence is evident in Nasty’s music, although Nasty emphasized the importance of putting his own story into his music, rather than someone else’s. Nasty’s life has proven to be full of unique experiences; his path to music partnership fell in place accidentally. Cole Bennington, Nasty’s manager and business partner, met Nasty through mutual friends, and instantly hit things off. Since then, Bennington has served as a sort of mentor to Nasty, and the two continue to work closely together to bring the Michael Nasty name to fame. Such a name as “Michael Nasty” warrants a bit of uniqueness as well. For now, Nasty is continuing his schooling at Towson as a marketing major, with a minor in music industry. Although his schooling does take time away from his artform, he tries to appreciate it for what it’s worth. Nasty referenced a course on Hip Hop history as one class he’s already liking this semester, which brought to light a heavier topic: his place in the Hip Hop world as someone who isn’t of the same marginalized culture. Bennington agreed, stating that Nasty has done well at acknowledging his life differences respectfully, and hasn’t tried imitating the lives of black rappers. Nasty believes that despite having an easier upbringing than other rappers, he can still make meaningful and authentic music. Nasty shared his plans to continue building his music career as he finishes his schooling and beyond. He already has plans in the works to grow MilkMen Records, the label company he’s starting with Bennington and their third partner, Sean Ainloo. He hopes to see it emerge as a huge competitor in the music industry and has plans to continue his rap and business career in California.